Citizens are encouraged to voice their objection to the proposed redistricting of West Chester Borough into two districts instead of one, according to Mayor Carolyn Comitta and Borough Council President Holly Brown. The Pennsylvania Legislative Redistricting Commission has proposed to split the Borough of West Chester into two separate House Districts. Currently, House District 156 serves the whole of the Borough of West Chester, an area of 1.8 square miles. But due to redistricting, a process that occurs every ten years to insure that all districts have about an equal number of persons residing within them, the Borough would be served by both the 156th and 160th districts. The new boundaries would set by the wards. Ward 1, 2, 6, and 7 would continue to be in the 156th District and wards 3, 4, and 5 in the 160th District. “We are asking West Chester citizens to contact the Legislative Reapportionment Commission by November 30 and let them know that West Chester residents object to splitting the Borough into two legislative districts,” said Mayor Carolyn Comitta. On November 16, the Borough Council passed a resolution to urge the 2011 Legislative Redistricting Commission to maintain the entirety of the Borough of West Chester in a single Chester County legislative district. The resolution indicates that West Chester is a compact, historic urban municipality and is the County Seat of the County of Chester. It also states that West Chester is “an urban community that is unique and does not share the same characteristics as the surrounding suburban communities.” Read the entire resolution (PDF). 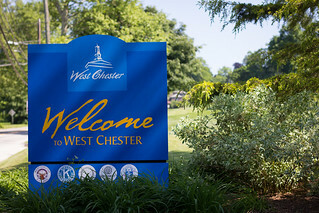 Of equal concern, part of West Chester University would be separated from the 156th and put into the 160th, thus dividing the university between two districts. 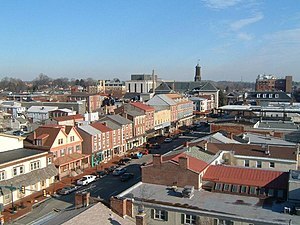 Further, there are no common borders between West Chester and any Delaware County community. Some also feel that the division of West Chester Borough is not absolutely necessary and is therefore in violation of the State Constitution. Citizens may download a petition (PDF) and contact members of the Legislative Reapportionment commission with their concerns.